You must be able to attend all three sessions. No discount/refund will be given if a session is missed. 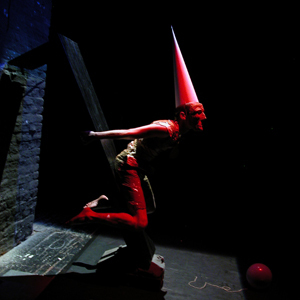 Concession available to companies performing at Summerhall and AR Fringe performers. This workshop runs over 3 days; 20th, 21st and 22nd. An exceptional opportunity to work with Moscow’s extraordinary blackSKYwhite, and gain insight into their unique development process. Each daily 3-hour session addresses different aspects of Mediatronic Theatre. “Alien Body” focuses on physical training, recognising and breaking the link between personality and movement, and observes the impact on space by geometric positioning and control of the body. “Time-Space” compositional training explores the concept of drawing virtual space around the body in order to give the illusion of physical objects being changed. Lastly, “The Cell” approaches the challenge of realising the techniques explored in a formal theatrical context. "Astonishing, disturbing, truly indescribable. blackSKYwhite have created a new language of movement. " "The overall effect is poignant, terrifying, exhilarating - leaving audiences gasping, and leaping to their feet to cheer. " "Working closely with the actors, director Dmitri Aryupin has created a disturbing, terrifying and poignant performance which leaves audiences shocked, terrified and exhilarated. " "The group from Moscow threw open a window of time. A window of time to the age of speechless amazement."